Can I Eat Sole While I Am Pregnant? 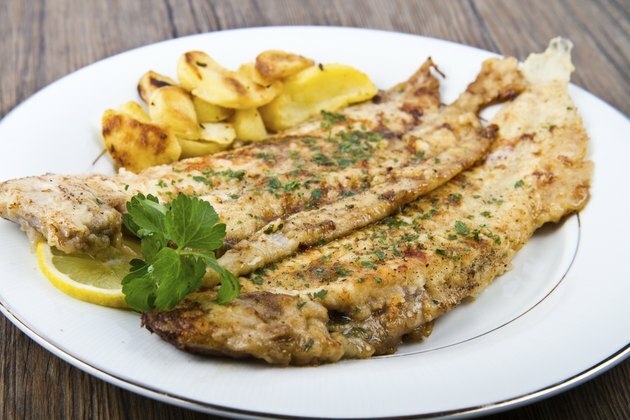 The warnings about limiting or avoiding certain types of fish when you're pregnant may have you wondering about sole, a type of flatfish related to flounder. Because fish contains omega-3 fatty acids, which have a number of health benefits during pregnancy, most physicians recommend eating fish as long as you choose fish low in contaminants such as methylmercury. Sole contains low levels of methylmercury. The oceans have become contaminated with pollutants and industrial waste products such as mercury and polychlorinated biphenyls, more commonly known as PCBs. Bacteria in water convert mercury to methylmercury, a form of mercury humans easily absorb. Mercury can damage the developing fetal brain. The U.S. banned the use of PCBs in 1977, but they remain in soil and water for a long time. Foods, including predatory fish, are the single largest source of PCB exposure for most people, according to the Wisconsin Department of Health Services. Like mercury, PCBs can damage the brain of the developing fetus. Omega-3 fatty acids found in fish have health benefits for both you and your baby. Omega-3 fatty acids promote healthy brain development in the fetus and have heart-protective benefits for you. Sole also serves as a good source of protein needed for fetal growth and a low source of saturated fat. The U.S. Food and Drug Administration ranks sole along with other flatfish as a fish with lower concentrations of methylmercury, with a mean of 0.056 parts per million. By comparison, swordfish, one of the fish with the highest mercury content, contains 0.995 ppm. Although English sole does contain PCBs, it's safe for women to eat four or more times per month, the Environmental Defense Fund reports. When you're pregnant, the FDA and U.S. Environmental Protection Agency recommend limiting your fish intake to 12 oz. per week. The 2010 Dietary Guidelines published by the U.S. Department of Agriculture recommend consuming between 8 oz. and 12 oz. of seafood per week. Avoiding drippings, which contain more fat, because PCBs accumulate in the fat of fish. Don't fry sole or other fish because frying may seal in contaminants.